It's March, so apparently it's kiddie table paintin' time! Last year around this time, I gave fresh life to the Ikea Kritter table and Sundvik chairs for Ashlynn's room. Many times I wanted to bring them down to the playroom where we spend most of our day, but I just love how they complete her room and I don't leave a strange awkward space between the chair and her crib. She does like to sit there and do puzzles while procrastinating before bed, so they do get daily use. Just not as much as they could. We picked up the more affordable Latt Table during our New Year's Ikea run, you know my birthday trip treat - the glamorous life of a 31 year old mother of two. And naturally, in the mudroom, boxed up, it sat for nearly two months. I just couldn't figure out what I wanted to do with it. I had thought a lot about painting it in some coordinating way so it could easily mix and match with set we already have. For the handful of times I might actually use them together - birthday parties and play dates which aren't a frequent occurrence - especially those birthdays, ha. I also wanted it to fit in seamlessly with furniture and items we already have in the playroom, since my goal is finally decorate the room with a little more purpose than just a bunch of Fisher Price products lining the perimeter. And as much as I initially wanted to dip dye it, I'm slowly getting over that trend. Since we have a black/brown expedit in the room, I thought we'd stain the table to match. The Husband did this one afternoon that wasn't below freezing outside. He used an ebony stain and it matches the bookcase perfectly. I decided to leave the table top clear for now, but am toying with the idea of adding a vinyl decal. The chairs I painted the same color as Ashlynn's room table's legs, Stonington Gray. One, so they'd be neutral, and two, so they'd be able swap to her table and not look too out of place. Once they were painted, I so badly wanted to use the same coral paint. I thought I'd paint the inside of the back rest or stencil a design on the seat or use it to color block. Instead I rummaged through my scrap fabric bin and found a floral print that matches the gray in the chair and blue in her little KidKraft kitchen perfectly. Not too mention, it has a retro vibe that goes great with her little throw back kitchen. I stretched the fabric around the seat and slide it through the grooves. It was a little tight, but that helped keep the fabric taut. I have experienced a little movement and loosening from Ashlynn scooting to get herself situated when seated. However, I'm still not 100% this is the final version. I wanted to avoid the spray adhesive or coating of modpodge, but I would have placed either adhesive between the chair and fabric. Right now, I like that I can swap the fabric if I want or paint the chair bottom if I think of some design brillant enough. I also am concerned that the fabric isn't wipeable, I'll need to replace it at some point either from markers, peanut butter and jelly, or smashed in playdoh accidents. After that, I still thought they were missing something so I grabbed our frog tape and taped some stripes off on the back rest. Another step we haven't taken is the polyurethane. Because of this, we already have some scuffs from the black table to the gray chairs. We'll definitely get a coat on the table as soon as the weather warms up enough to do it. When I finished getting the chairs together, I let Ashlynn find the set after her nap in the middle of the playroom. She was so excited to serve up lunch toast to Annie and play and play and play. Love the way it came out, so pretty! I am in love with both of these table sets. You seriously have the DIY gene, and I need it. Lol. I long to do things like this. i LOVE THESE!!! i mean i like the OG but the flowers are to die for. total perfection! This is so cute! This spring we are for sure getting a table and chairs for Hudson! I love the fabric on the seats! And you're brilliant for making the chairs mix and match with your other table. I say this to everyone who buys the LATT table, but Do Not let adults think they can sit in them. They WILL crack the seat. Ours were cracked (grrrr) within a week from adults sitting in them. I actually threw out one of the chairs I was so mad about it. Should have kept it and tried to fix it. You would think it'd be obvious they aren't for adults. My SMIL sat in A's one day and I cringed the whole time. I should have said something, I was dying inside since I took all the time to paint the chairs, you must have been heartbroken. Not over the $, but the time and love you put into them! Totally! The chair + table set was cheap, $20 I think, but the time (all that precious time spent in the garage painting) it took was worth so much more. I really should have said something, but my MIL was playing with Owen and I didn't want to seem like a brat. I've learned to speak up since then! I really wanted to use the watercolor-ish floral fabric I used for K's blanket but didnt have enough Now I'm contemplating gold or black dots, but I'm trying to remind myself it should be playful and fun for her, not trendy or stylish for me! Love love love! We're getting an Ikea here next year and I absolutely cannot wait! Seriously, is it June of 2015 yet?!!! Thank you, Tiffany! I do like to consider myself crafty, though you put a paint brush in my hands to make art and I freeze, artistic I am not! Definitely! The Latt table is so inexpensive, really is a great to pick up one or two! This is so adorable!! 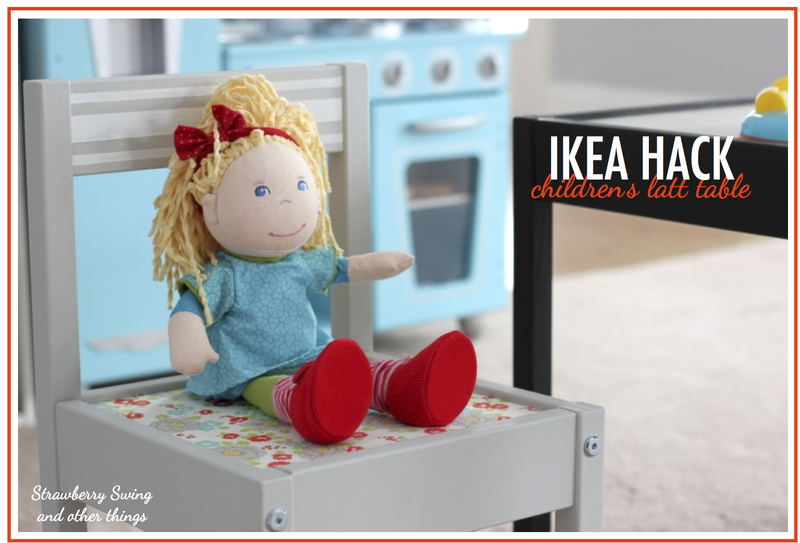 I try and avoid Ikea (I hate it's mazelike setup) but I think this is something I am going to have to buy and DIY! Great 'hack'. I love the pictures, just at the table in her own kitchen. :) How fun. this is too cute!! i love the starbucks cup in the background! awesome job mama! I LOVE THIS! Especially the chairs. My gosh. I've been dying to do one of these IKEA hacks with a table for the toddler but I just don't know where we would put it right now. This has me wanting to do one even more! That's awesome. Ours is really close and there is another in the city, so we are pretty lucky. I can't imagine having to drive hours to get to one! The table looks great! I also have a question, what brand is your play kitchen...it is adorable! It's KidKraft, it's linked above- hope that helps! oh my goodness, both tables look great! I wish I had just 1 crafty bone in my body! OMG so cute! All of it! I love that it is so fun!! I am really thinking that I need to get Ellie one of these tables - I know she has some time before she is ready but they are just TOO cute!! Have you seen the chaise loungers with umbrella's at Costco for the little ones? Too cute! Thanks Kary! That's a great idea, though I'm not sure how thin plexi glass comes, our chairs were pretty tight with the fabric over the seat sliding through the groove. I'll have to check at the store and maybe we could make the groove wider somehow. I was also considering scotch guard, lol. I thought about Modge Podge, but figured that would be a fail! I'm not putting the plexiglass I the groove. Just planning to rest it on top. That way I don't have to wrap fabric, just cut it to size and slip it under the plexiglass. That's my plan anyway. I can let you know how it turns out if we ever get around to cutting it. The little notches are making it a bit daunting. This is so beyond adorable! Love how you transformed the table! I need to do something with ours!